Why I read this book: The summary sounded really interesting to me. 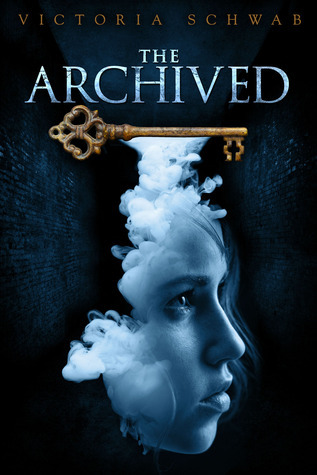 The Archived is a book that I wanted to like more than I think I actually did. Doesn't that summary sound super interesting? Well, it was and it wasn't. The Archive is told in flashbacks of memories had with Da, our heroines grandfather (which is not explained and I thought it was her father for a while until I realized) teaching her to be a Keeper, and the present day where her family has just moved across town to an old hotel converted to apartments to escape the memory of her suddenly departed younger brother. There is a lot going on in this story. The flashback, the grief of her parents (both who are handling it differently), her job as a Keeper and that whole world of the Archive, the move to the hotel, the opening of the coffee shop, you get the gist. At first this is a bit overwhelming, but once the plot kicks in a bit more (later than I would have hoped) it get's its sea legs. The plot is a mix of mystery and suspense. Mac is a Keeper so she gets to go to The Archive and the Narrows (the world between the worlds). The Narrows are what she is suppose to keep clean from woken Histories. Her job is to guide them back to sleep. Because she has just moved she is assigned to a new territory and there is where things get strange. The characters are just as much of a jumble as the plot. The characters never really connected with me and it felt like we had only scratched the surface with them. Mac herself acts erratic at times, and I am not sure if it is her reaction to grief or just story telling that I didn't connect to. Wes, our requisite friend, however is awesome. He is a character that pops up, and I just want to hang out with him. That was my problem with this. There are a lot of things that are pretty cool concepts, but the execution left me feeling like an outsider looking in. Ben's (Mac's brother) death is a whole lot more core to the story then the summary makes it sound. The plot is pretty predictable once that shows up. I think my favorite character was Wes. This story needing more time with him. I think the world building was just okay. It goes back to my "This is a great concept, but poor execution" thing. Will this book work for some people? Sure. It's not unreadable by any means. It is also one of those sneaky series books I didn't know was a series. But the one good thing it has going for it is that is can be read as a stand alone. I am perfectly content. I see where she can keep going, but I dont need to follow. Overall, the book was okay. If the summary interests you maybe check it out from the library or read the sample. I think you would be able to tell pretty quickly if it was worth your time. "Great concept, poor execution" is a recurring theme in some of my reviews as well. Sometimes I wonder if I'm just becoming too picky. I dont think so. Three stars for me is actually my average grade. This winter I have had a large amount of fours, but I haven't had a five star rating in a while. I think that in this case, it was to jumbled trying to figure out what it wanted to be. It's her first book (I think) so I mean she has the avenue to improve. Aww, I'm sad you didn't like it more. I liked Mac, but sometimes got annoyed with her single-mindedness regarding her dead brother. I didn't like Wes as much as you did, but he did grow on me as the story progressed. I really loved the whole world of The Archive, though! I think she wrote it to be a standalone at first, but now there's a sequel. You don't plan to read it? I thought the story itself was interesting, just not what I was expecting. And a little bit forgetable, to be honest (since I wrote this review about a week after I finished). I think the strongest part of the story is the world of the Archive, but we didn't spend enough time there for the world building to really take hold, I thought. I don't really know if I plan to read the sequel. It's not something I've ruled out, but not something I would rush to read. I'm sorry this one didn't work out for you as much as you hoped. I really liked the world building and the characters myself but I definitely see the validity of your points. I do agree however that the beginning can be a bit over whelming and it takes a little while to get into the flow of the story. Yeah, this one may just come down to taste. I'm glad some people liked it, because like I said, I could see the potential. Well, I'm glad this was a giveaway and I didn't buy the book, then. I haven't gotten around to reading it yet, but I think it might have just dropped down on my TBR pile. I'm really sorry to hear that this one didn't work out for you. I loved the world building and the characters, especially Mac dealing with her own grief while working with the dead being so difficult. But I can understand your points. I was definitely confused at first with the flashbacks popping up at weird times. And it took some time to really wrap my head around what was happening in the story. Honestly I am glad it is working for some people. I am glad you liked it! I only got to page 100. There was absolutely no plot. Too much time was stuck in Mac's head and how she wanted to be "normal." Oh.